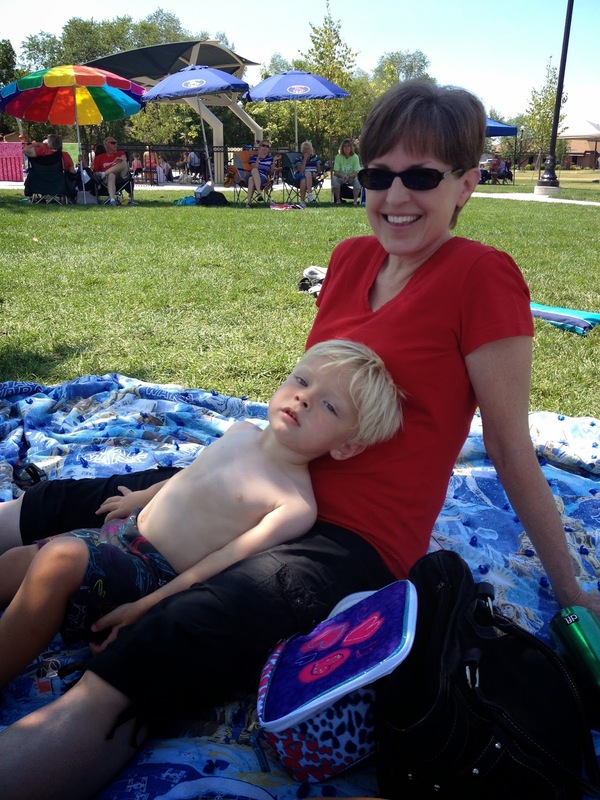 He is completely unmotivated by cars, candy, stickers or any kind of reward. "Carson! Look at this cool tractor you get if you go potty!" I'd say, trying to entice him. "Wooooooooow!" 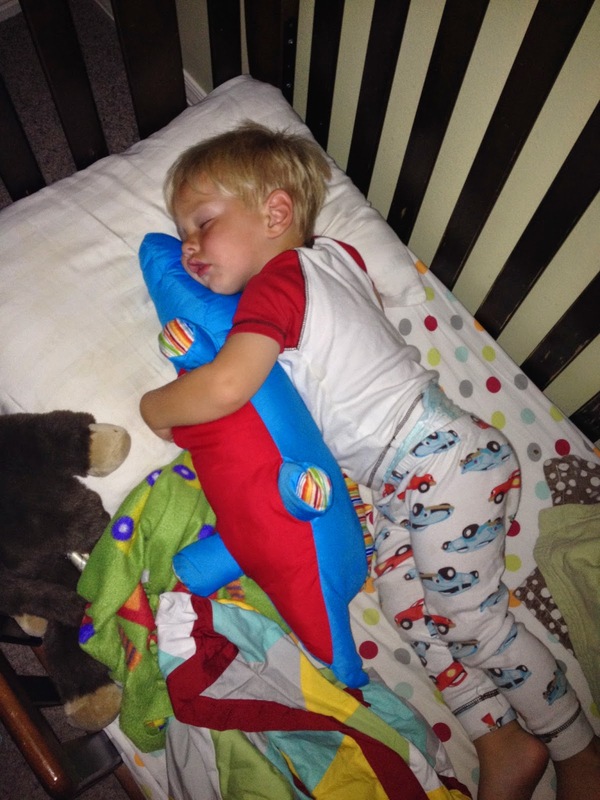 He'd say while jumping up off the potty to run around the house naked, unbothered by the unopened toy he left behind. Grrrrrrr. Carson has the bladder of...something with a really big bladder. It didn't take him long to figure out he didn't enjoy wetting his undies. So, naturally, he just held it in. All. Day. Long. Even with all the juice I was filtering into his body, he still kept it all bottled up. He quickly learned saying he needs to go potty got him out of nap time. He happily spent hours sitting on his potty if it meant he wasn't stuck in his room for nap time. Likewise, I made the mistake of letting him play my phone while he was sitting on the potty, so he would declare he needed to use the potty any time he wanted a few episodes of Curious George. 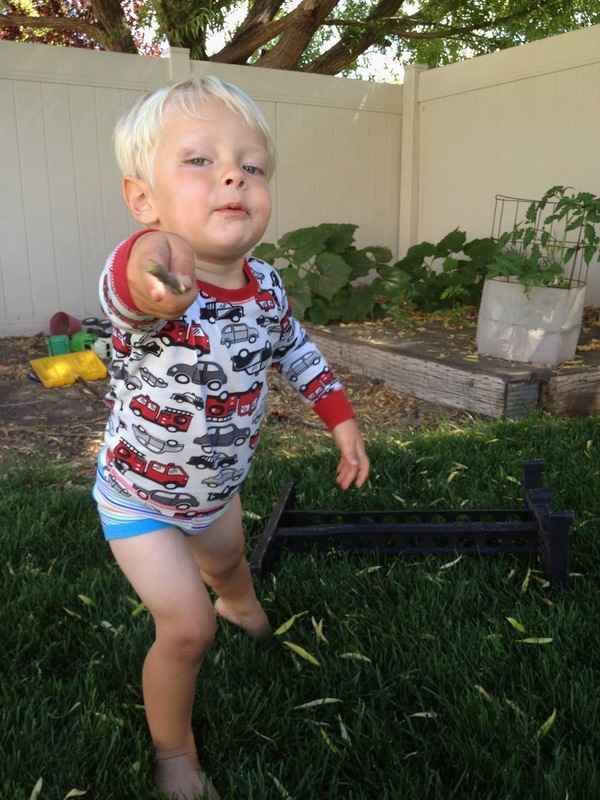 All my potty training tactics were VERY effective...on a 4-year old. Eli was eager to slurp down his juice like a good boy, and then proudly reward himself with candy every time he managed to release any kind of bodily fluid. Made me realize maybe I should just wait until Carson is 4 and all my attempts might actually get me some potty progress. Until then, we've given up! 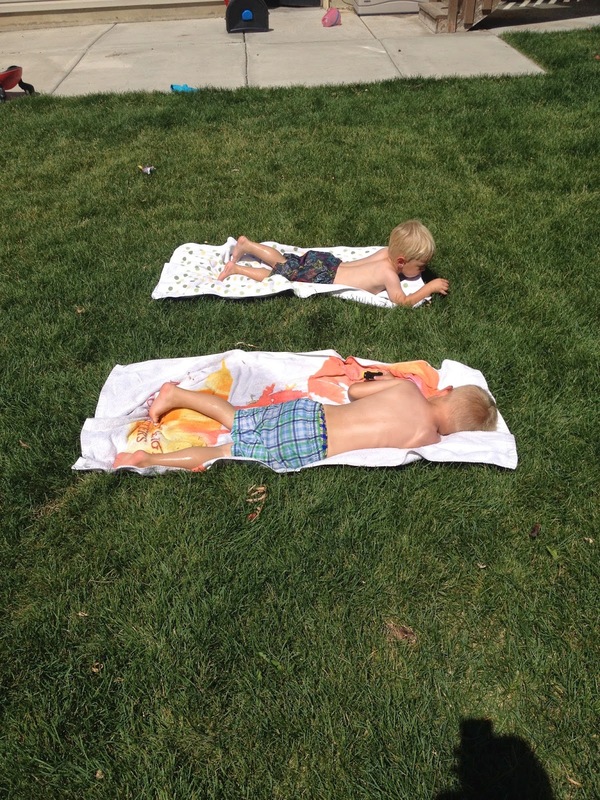 About once a week we've been having mini pool days. 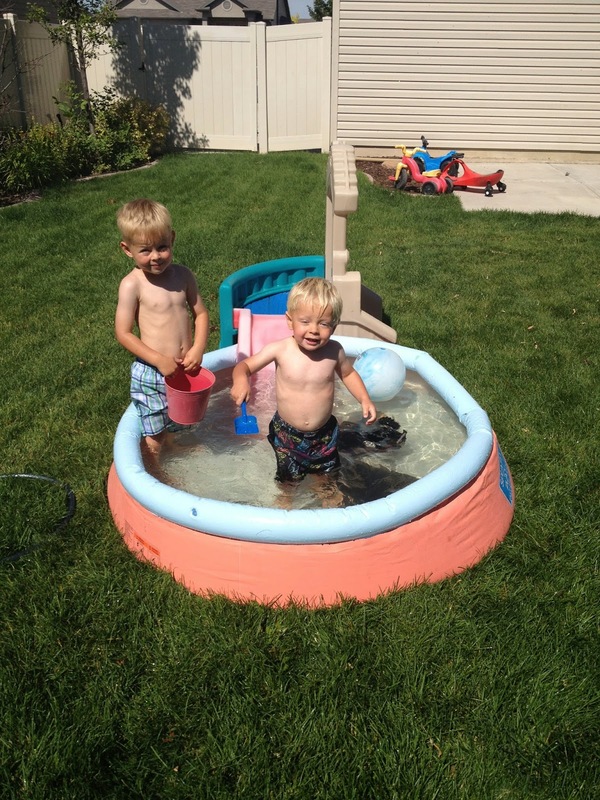 The boys love when we put our tiny slide into our tiny pool. Anything to beat the heat! 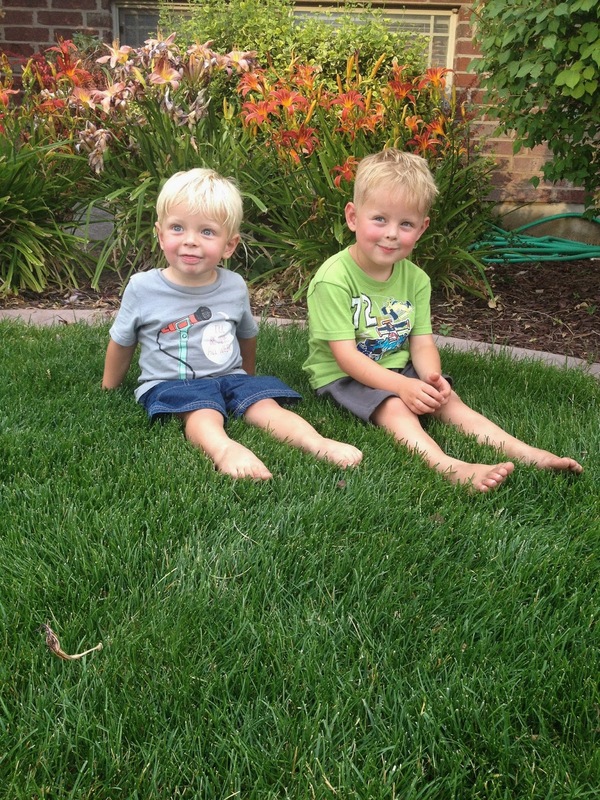 Our days are filled with lots of grasshopper and rolly polly hunting when we're not swimming. 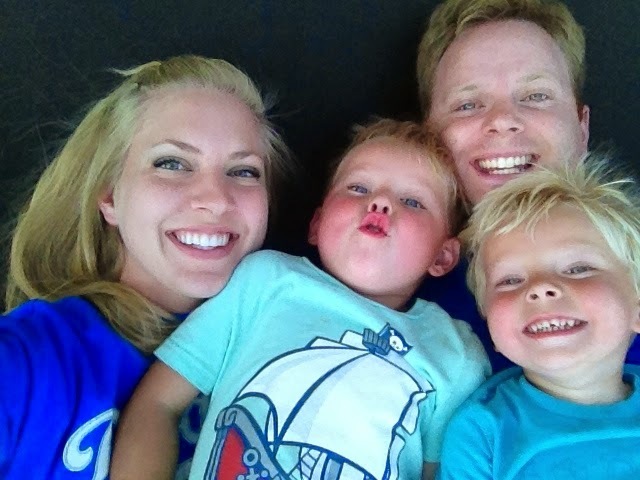 We also love to hit up the park! 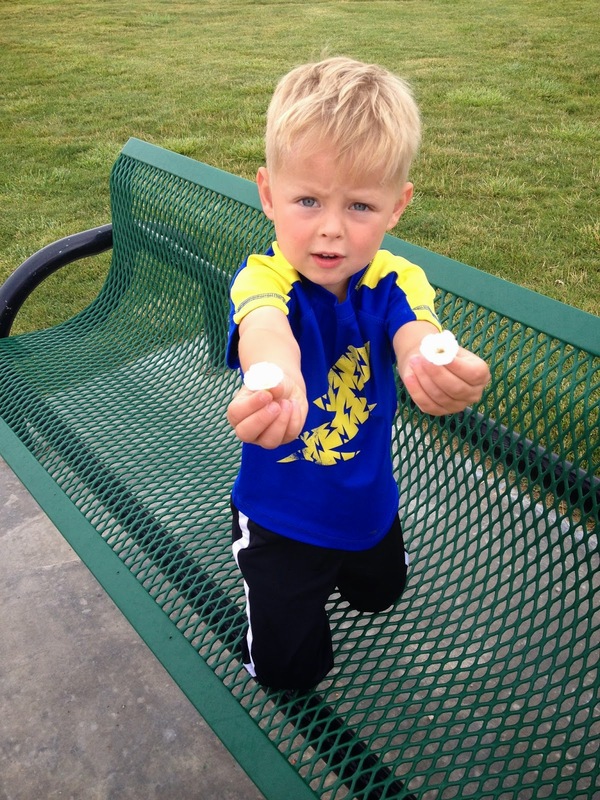 Eli was so cute to pick me "flowers" at the park one day. I don't know how he even knows it's nice to give people flowers. It was darling. Carson has grown attached to a dinosaur I made a couple years ago. 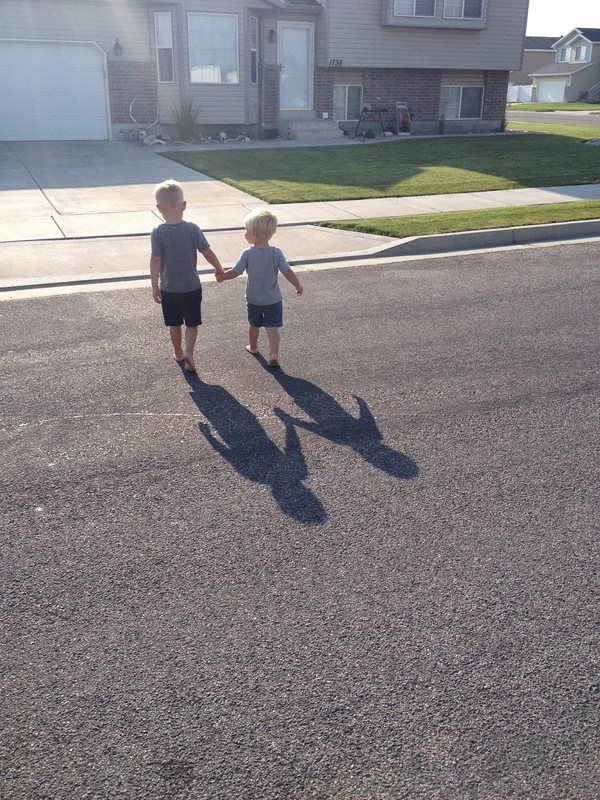 Melts my heart. 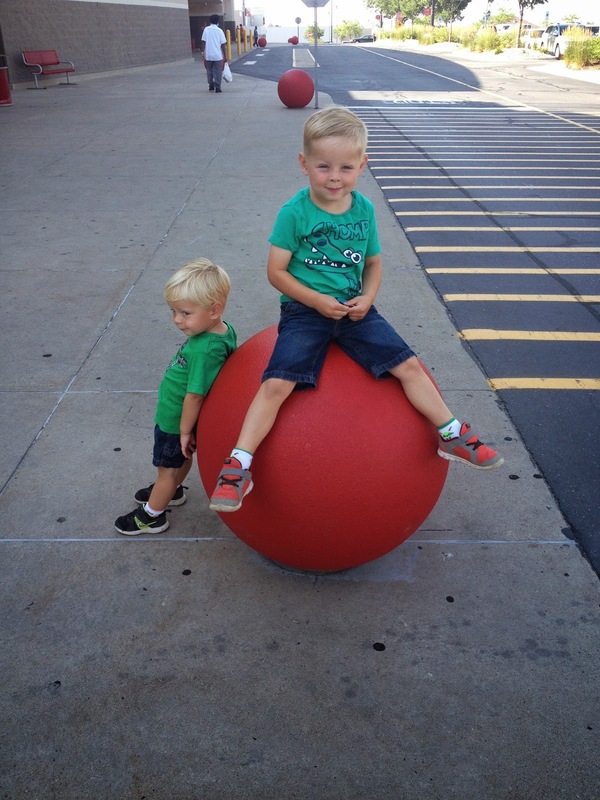 Thanks to my mom, the boys think it's mandatory to pose with these balls outside of Target every time we make a trip there. 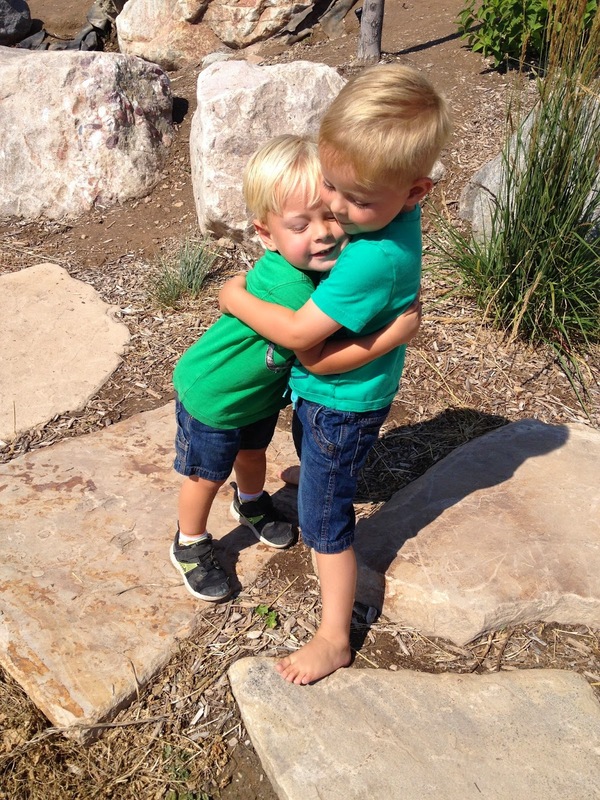 One day at the park the boys were spontaneously hugging each other. Coincidentally, it was the day after I wrote this post about how crabby and whiney they had been. Always trying to prove me wrong. It's true. They definitely have their cute moments. 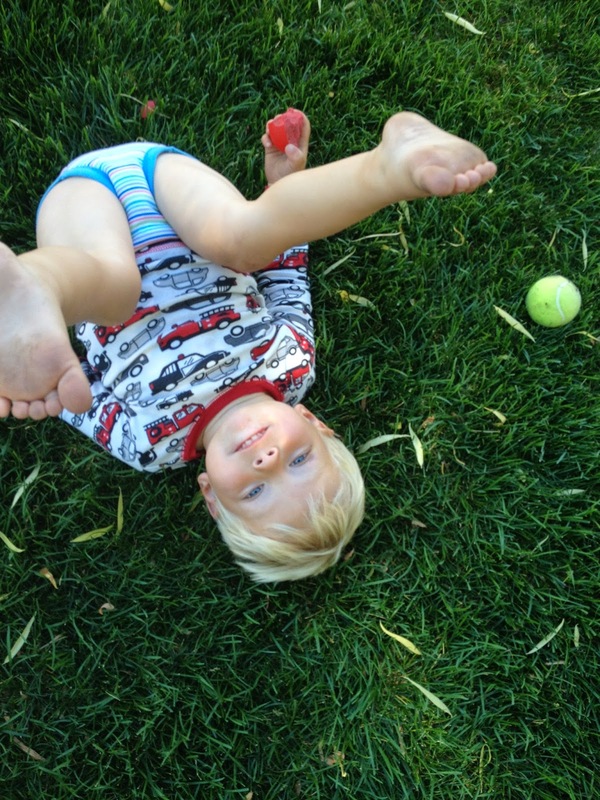 If we are able to go on our walk before 9:00, Eli usually comes home with a handful of rolly pollies. With every bug he picks up, he proudly says, "Mom! I'm protecting this rolly polly!" 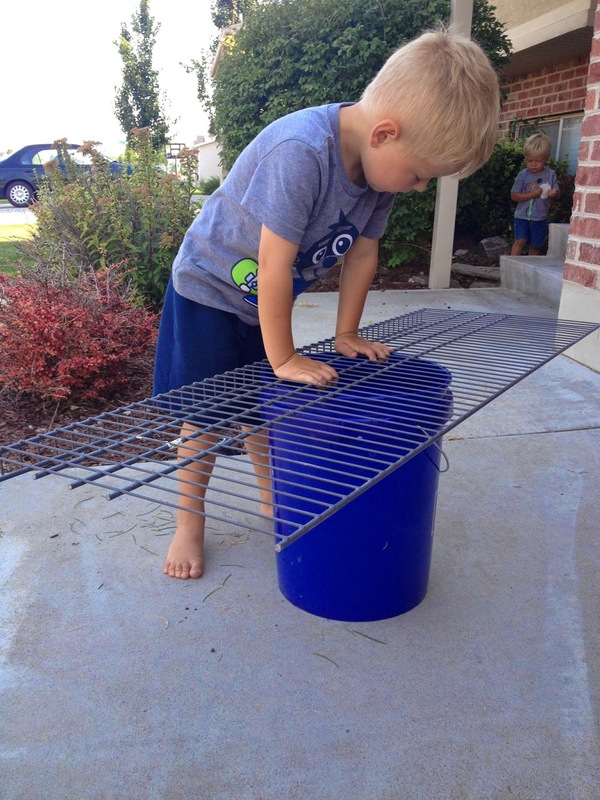 After a particularly successful rolly polly hunt, Eli came home and made a cage for his shelled friends. It takes a special boy to give himself an ice-cream mustache. Carson is so funny. If he is bored, everyone knows it. As I told my sister, Carson gets abusive when he has nothing to do. On many occasions, he has walked past complete strangers and smacked them on the legs. 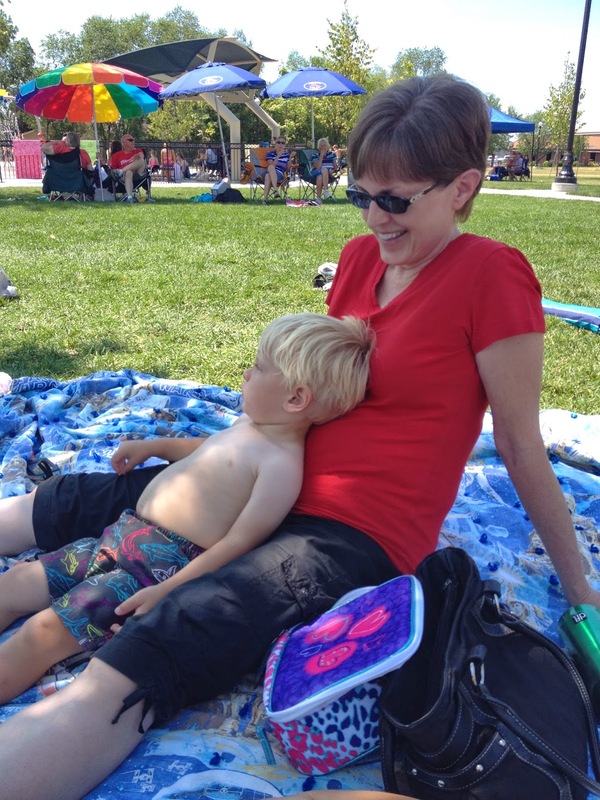 So he had no problem flopping all over my mom when we went to a splash pad last week to let her know he was done with the outing. If he finds himself bored, and he's not hitting or flopping, he's usually perfecting his grumpy face in the mirror for future reference. Two-year-olds!!!! I forgot how crazy they are! You need a video of Carson flopping all over me. The pictures don't quite capture it all. I'll take a snuggle with him any way he'll give it.